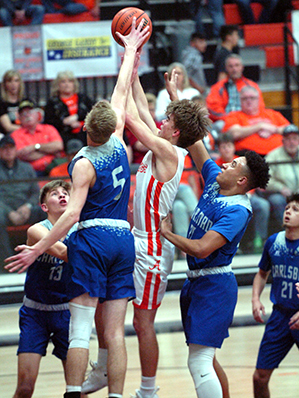 Artesia boys come up short of hot-shooting Alamo, rout Santa T.
Friday’s 59-56 loss to Carlsbad at Bulldog Pit was a bitter pill to swallow for a Runnin’ ‘Dog basketball team that had a chance to even the county rivalry for the 2018-19 season. It was understandable, then, that the boys in orange might’ve been a bit drained when Saturday afternoon and the Desert Warriors of Santa Teresa rolled around. And while the Bulldogs fended off the doldrums for the bulk of three quarters, when they set in in the final eight minutes of play, they came dangerously close to resulting in an upset. The ‘Dogs would step back up, however, to fend off Santa T.’s furious fourth-quarter rally, taking the contest by a final of 69-57 to earn the weekend split that puts them back at .500 on the season, 9-9. “It was Jekyll and Hyde,” head coach Michael Mondragon said of his squad’s outing Saturday afternoon. “I thought we did some pretty good things in the first half, but in the second half, we just had a lot of letdowns mentally. Artesia didn’t get off to a particularly quick start Saturday, but they took advantage of a few Desert Warrior turnovers and breakdowns on defense to log layups that saw them up 12-3 in the waning minutes of the quarter. Kale Mauritsen, Cody Smith and Johntae Rodriguez all posted four points in the period to help send the ‘Dogs into the second up 16-7. Mauritsen opened that quarter with a long two and a pair from the free-throw line, but two three-pointers from Santa Teresa’s Nathan Castorena quickly pulled the Warriors back within eight, 21-13. Rodriguez, Clay Houghtaling and Jacob Creighton would combine for an 8-0 run that gave the Bulldogs back some breathing room, however, and a Rodriguez coast-to-coast layup, free-throw-line jumper by Houghtaling, and shot off the glass by Cole Kincaid made it 35-16 late. Santa T. was able to tack five to their total before half’s end on a layup and another Castorena trey, sending the teams up the ramp with Artesia in the lead, 35-21. 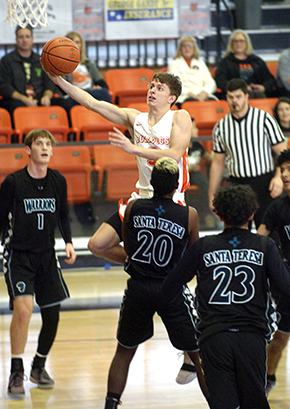 Mauritsen would log a longball in the third quarter, but the ‘Dogs did the bulk of their scoring from the paint, where Anthony Armendariz, Smith and Creighton all picked up four points to help Artesia maintain its 14-point advantage going into the fourth, 52-38. There, however, the Desert Warriors found a spark, kicking off the quarter with an old-fashioned three-point play, then draining back-to-back shots from beyond the arc a few moments later to find themselves back within five, 54-49, with 5:30 still to go in the ballgame. Santa Teresa answered Artesia blow for blow to maintain that margin through the two-minute mark, 62-57, as the ‘Dogs were hindered by five untimely turnovers. As the contest fell under one minute, however, the Warriors were forced to begin fouling, and Artesia got the job done at the line, going 7-8 in the final seconds to preserve the win, 69-57. “Everything that’s kind of holding us back right now is not something other teams are doing to us, it’s things we’re doing to ourselves,” Mondragon said. “We’re going to have to start evaluating things and making some adjustments, and we are. Smith finished with 14 points for the Bulldogs on the day, followed by Rodriguez with 13, Houghtaling with 12, and Mauritsen with 11. Castorena posted 30 for the Desert Warriors. It was the ‘Dogs who very nearly logged the upset in the final stages of Friday night’s Homecoming game against the Cavemen before a packed house at the Pit. After falling behind 19-11 at the end of the first quarter, Artesia came storming back in the second, outscoring the boys in blue 21-11 to lead 32-30 at the break. Rodriguez led that charge with a pair of three-pointers, while Houghtaling and Armendariz both added four points in the paint and Smith three from the stripe. Carlsbad’s Josh Sillas, however, had already proven himself on from beyond the arc with four first-quarter longballs, and the Caveman resumed his bomb-dropping in the third, joined by Riley Hestand, who added a pair of three’s of his own in the period. A long, sailing trey at the buzzer to end the third by Sillas proved to be of particular importance as the game wore on and sent Carlsbad into the fourth on top 48-43. Mauritsen kicked off that quarter with a trey that was answered by Hestand, but the senior posted another around the 5:30 mark to pull Artesia within four, 53-49. And a bucket off the glass by Houghtaling, a Smith free throw, and two from the stripe by Mauritsen later, the ‘Dogs had regained the lead, 54-53, with 1:58 remaining. Jumpers by Sillas sandwiched a breakaway layup from Rodriguez, however, to turn the tables in the Cavemen’s favor, 57-56, and with 11 seconds on the clock and a chance to set up the game-winning shot, the ‘Dogs threw the ball away. They had no choice but to foul Sillas, who hit both ends of a one-and-one to put Carlsbad three points up, 59-56, with one second on the clock. Artesia was unable to get off a shot in time on the inbound pass. “I’m pleased with the way our guys came out and competed,” Mondragon said. “We played hard in the fourth quarter, we got after it, and our defense was a lot better, especially after that first quarter when Sillas got hot. With a good player like that, you just have to try to get a hand up and contest the shot, but he made a lot of tough shots in that game. Mauritsen led the ‘Dogs on the evening with 15, followed by Rodriguez with 11, and Armendariz and Smith with 10 each. Sillas finished with 33 points for the Cavemen. Artesia shot 53 percent from the field on the night to Carlsbad’s 42 and was 8-13 from the line to the Cavemen’s 5-5. The ‘Dogs will now prepare for another tough week, as they host Roswell High at 7 p.m. Tuesday at Bulldog Pit before heading to Clovis Friday for a 7 p.m. game against the Wildcats. “We just have to get better from this and take the challenge, take it personal,” said Mondragon. “Every one of those guys understands they have a job to do. When one guy isn’t doing their job, we’re in trouble. It’s another tough week this week with two 5A games. These are our last two practice games before they start counting, so we have to focus on each person getting better and doing their job.